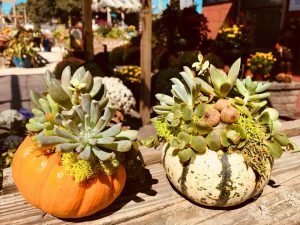 Join us on Thursday, October 18th from 6:30-8:30PM or Thursday, October 25th from 6:30-8:30PM for a Fall Succulent Pumpkin Workshop! Create your own succulent pumpkin planter with professional gardener Maureen Monroe! Tickets are $39.99 and all materials are included. This event is BYOB.